By Noemi M. Gonzales – A Bilateral agreement aimed at boosting defense ties between the Philippines and Canada was signed on Saturday during the state visit of Prime Minister Stephen Harper, who also noted the important economic partnership of both countries. For his part, President Benigno S. C. Aquino III, who described the event as a “fruitful” meeting with his counterpart, cited the growing interest of Canada in the Philippines as a viable investment hub, expecting increased trade relations with the North American country in the coming years. In a joint press conference after their bilateral meeting in Malacanang, Messrs. Aquino and Harper witnessed the signing of a memorandum of understanding between the Department of National Defense and the Canadian Commercial Cooperation on government-to-government transactions in defense and military-related procurements. Without disclosing the equipment to be purchased, Mr. Aquino said that the deal will ensure expeditious and honest procurement transactions with the Canadian government. “The fundamental issue is that we have a lot of outmoded equipment… Now, Canada is at the forefront of various equipment that redounds to increasing capability — or to increase the capacities and capabilities of our own forces to meet the needs of defense for our country,” Mr. Aquino said after the meeting. “This agreement will create new opportunities for Canadian businesses in our defense and security sector,” Mr. Harper said for his part. On trade and investment, Canada has pledged to increase investments for a “sustainable economic growth” in the Philippines. “And so I’m pleased to announce that the government of Canada will make further investments here over the next three years with the focus on sustainable economic growth,” Mr. Harper said. “With implementation assistance from the Asia Development Bank, these funds will help create new opportunities across the Philippines. The government of Canada has also approved the grant to the United Nations Entity for Gender Equality and the Empowerment of Women… These funds will be used to help improve the rights of women and girls throughout Southeast Asia,” he added. The Canadian government has also recognized gains in the country’s reforms in good governance and the recent signing of the Framework Agreement between the government and the Moro Islamic Liberation Front, resulting in a renewed interest in investment and trade. “We also talked about increasing our trade and investment ties in keeping with the growth of our people-to-people ties. Canada recognizes the economic gains resulting from our commitment to good governance, integrity, and transparency, manifested in the reforms we are implementing in the Philippines. We look forward to increasing trade and investment with Canada,” Mr. Aquino said. There are about 800,000 Filipino workers in Canada. Two-way trade between the two countries amounted to $1.5 billion last year. 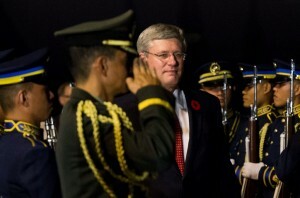 Mr. Harper arrived in Manila on Friday from a similar state visit in India. He is set to fly to Hong Kong on Sunday before returning to Canada. He is the first Canadian Prime Minister to visit the Philippines since 1997.
hello, thepinoy readers and alike! We are currently searching for OFWs in the US and are giving some job opportunities that can be worked on anywhere, either at home or at the office. The above information is for my nephew who works in Saudi Arabia as Field Engineer. He is interested finding a job in Canada, specifically Toronto, Ontario area. He is an Electrical Engineer in the Philippines. Can you please help him. me too, i’m interested to work in beautiful Canada. I’m an AS400 COBOL Developer.